Not so hot – ocean temperatures around the USA are not anywhere near record levels | Watts Up With That? The map in Figure 1 shows the July 2012 sea surface temperature anomalies, based on NOAA’s ERSST.v3b dataset, for the coordinates of 24N-50N, 130W-65W. We’ll use those coordinates for the sea surface temperatures (not anomalies) of the U.S. Coastal Waters in the following two graphs. 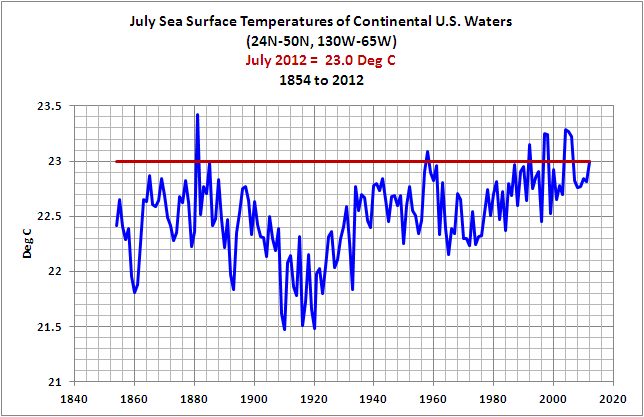 Figure 2 illustrates the July sea surface temperatures for those coordinates from 1854 to 2012, and Figure 3 shows the annual (ending in July) sea surface temperatures for U.S. Coastal Waters from 1855 to 2012. I’ve also plotted the July 2012 value in Figure 2 and the value for the period ending in July 2012 in Figure 3 to simplify your task of comparing the most recent temperatures to the earlier values. The sea surface temperatures of U.S. Coastal Waters are nowhere close to being at record levels for the month of July 2012 or the 12-month period ending in July 2012. I’ll let you decide (speculate about) what that means with respect to the claims of unprecedented U.S. land surface temperatures in July 2012. My priority is finishing my book about ENSO and its multiyear aftereffects. I’ve only got a few more chapters to write and then I’m done with the first draft of Who Turned on the Heat? The Unsuspected Global Warming Culprit, El Niño Southern Oscillation. Then I have to go back and read the 500+ pages to see what I wrote. The map and the data presented are available through the KNMI Climate Explorer. It would be instructive to actually look at the historical relationship between land temps and SST. You will of course be surprised. REPLY: Another incomplete crypto-comment from Mosher. -10 points for not saying what MAT is or why we should look at it. I can’t help but think that the “unprecedented” temperatures and “record breaking” drought are related, but not in the sense that the alarmists would have us believe. Because of the drought, the actual heat content of the air is likely to be low despite the “unprecedented” temperatures. This report on the coastal SST’s seems to corroborate that we aren’t seeing much heat build up despite the temperature “extremes”. Well, one might expect water and land temps to have some correlation? The mid west coast seems cooler in general this summer, though perhaps more variable – some very hot days (not by mid west coast standards that is – easterners and southerners put down your coffee cup before I say that hereabouts 30C is a hot day ;-). Up with that is the NASA folks now, just saw on yahoo’s open page a new NWS photo put together of a huge low center storm up in the artic just now. Ya, they seem to be going to use that storm as a “sea ice killer”. A quote from a NWS guy,,”Very strong storm” it may cause damage to the ice up there due to the “current thin condition of the ice” this could be a problem. You might see what they are up to, as when they do this they use things like yahoo and google main pages to make it look like real news. How can we have any confidence with temperature data points over 30 years old? There would have been very few stations and what depths with what current in the place at that time. Just the California seas change season by season depending on the Japanese current and then the el nino/la nina effects which are not predictable. No one can convince me that the 1800 and early 1900 have any accuracy during the early days they had the devil of a time just using the Gulf stream to aid shipping . . so How do they address these issues? Question for Bob. Is the Great Lakes data masked out in this analysis? Unusually Strong Arctic Storm Spied from Above. So here is an idea for your book: plot the maxima – it seems for reasons that apparently no one can explain I am the only one plotting them. It would also be instructive to consider the physics involved. At decadal time scales natural variability will dominate long term trends. Atmosphere over land will heat up and cool off much faster than sea surface does, and with far greater variability due to the tiny heat capacity of air versus the ocean. Over the long term however, the ocean with a mass 1400 times that of the atmosphere dictates just how far atmospheric temps over land can stray. The ocean is like a large adult dragging a tiny child by one hand through the mall. It is the screaming, crying, and kicking of the child that we notice, but these have little to do with the direction of the child’s motion. Steven, you are becoming a bigger prat day by day. What on earth has happened the Mosher of 2-3yrs ago. Are you for real. For crying out loud, mon ami, pull yourself together. We miss you. Nope. I had the map-making feature at the KNMI Climate Explorer on the “Contour” setting because it produces a nicer looking image. Here’s the same map using the “Grid” setting. Except for a chunk of Lake Michican, ERSST.v3b appears to capture the Great Lakes. Geert Jan van Oldenborgh of KNMI explained the difference between the “contour” and “grid” settings to me a couple of years ago, but I don’t recall the specifics. Based on his email, I use the “grid” setting when I present which grids have data. Phrased another way, I use it whan I want to show how sparse the source data is. I suspect Mosher is suggesting that the sea temperatures lead the land temps. That would put comments such as “the heat is being hidden in the depths of the ocean” to rest. If the sea temps start dropping expect the land to do so as well. And via the Hockey Schtick we have the following. I think there is a back story developing at the ENSO prediction page. I have been following the three combined predictions, dymanical, statistical, and what they call the “consensus” prediction model statistic. The consensus model prediction, over the year, has been getting closer and closer to the statistical model prediction. Have the majority of the dynamical models lost favor with the “consensus group”? Why? It should be noted that the majority of the dynamical ENSO models have a warming CO2-related fudge factor built in, probably ? from the days when scientists felt that CO2 would cause more frequent and more severe El Ninos. Caution: Blocking highs (a stationary high pressure system) can bring up warm temps from the South and cook us even though sea temps are below normal. These weather events make up the noise overlayed on the general patterns we get from oceanic and atmospheric oscillations. Sounds like a great idea for a post, Steven. You’re more than welcome to it. I, on the other hand, presented precisely what I wanted to present in the above post. Moshers cryptic comment is about the low SSTs during the 30s dust bowl I suspect. No surprises there Mosh, dry ground will always be warmer than damp ground given the same insolation. CO2 has nil to do with it. It would be instructive to actually look at the historical relationship between land temps and SST. You will of course be surprised. No particular surprise there Steven, natural variability in both the land and ocean, is within fraction of a degree. had temperatures elevated (not necessarily record highs) since June. higher than usual water tems just makes logical sense. impact when finally mixed with the Gulf of Mexico waters. California after the current temperature spike this weekend/next week. “Not so hot” could be rephrased as “Just about right”. Who Turned on the Heat? is a book I have been waiting for. I think it may be that ENSO holds an important climate key. Marble Mouth Mosher Mumbles MAT. My My. Anybody notice the new shape of hockey sticks in the Olympics? Looks more like a question mark on the end. Now that has got to sting. Poor guy can’t catch a break. Not positive, but MAT might stand for “Marine Air Temperature” – or Mosher Adjusted Temperatures. Hard to say. Over the long term however, the ocean with a mass 1400 times that of the atmosphere dictates just how far atmospheric temps over land can stray. The ocean is like a large adult dragging a tiny child by one hand through the mall. It is the screaming, crying, and kicking of the child that we notice, but these have little to do with the direction of the child’s motion. Your analogy is brilliant. I write to ask your permission for me to use it, please. Not suggesting heat in the pipeline. Another interesting source of data are the bouys that take air temperature. looking at the difference between SST, SAT and MAT is fun and instructive. Scripts in San Diego has so much Buoy data it would take years of super computer time to make a dent in it – so how accurate is the data we do see? In the paleoclimate discussion, La Nina (cold eastern Pacific) is believed to be the cause of US drought. Hoerling’s excellent discussion of past droughts (well before current interest) also emphasizes cold Pacific. Note the warm SSTs over the Atlantic downwind from the large US East conurbations, a reduced aerosol effect. 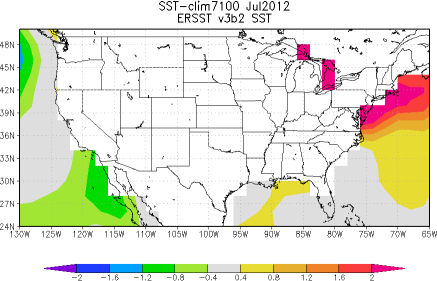 Not sure why Bob put East and West coast SSTs in the same graph. The oceanic influence will come from West coast (Pacific) waters, with some contribution from Gulf waters. East coast (Atlantic) waters will have no influence. And West coast waters are unusually cool. Yeah me too. What happened to old Mosh? I enjoy “fun and instructive” Mr Mosher, so help me out. Assuming some of the old Mosh is still in there somewhere. Thanks. Philip, scroll up to Figure 1. The longitudes are listed on the map. 130W-65W captures the waters for both coasts. Interesting. Put sst, sat, and mat into a google search and now you get Mosh’s comment on WUWT popping up. Fun and instructive? Sort of. And as far as I know, the Hadley Centre’s Marine Air Temperature dataset, MOHMAT, has not been updated since 2007. Bob – Sea surface temperature in general has very little to do with continental interiors with the exception of the SST in the Eastern Equatorial Pacific. That is because the El Nino wave makes landfall there and spreads out. This warms the air above it, warm air rises, interferes with trade winds, mixes with prevailing westerlies, and thereby raises global air temperature. When that El Nino wave then falls back ocean level behind it drops by half a meter, cold water from below rises up behind it, westerlies are cooled, and a La Nina begins. It is ENSO that is globally a prime mover of temperature and its workings are laid bare in that part of the world. Psychiatrists don’t try to puzzle out a patients’s cryptic comments — they just note it as a symptom — one usually associated with megalomania. Being something of a cruel person I am tempted to send you a “Freedom Of Information” request demanding that you explain your comments — because I am positive such an action would serve to validate your deluded opinions about yourself and escalate your symptoms further — surely leading to a quicker and longer hospitalization. As others have said, a mention of the acronym’s meaning or a link would be helpful. Otherwise, one could spend hours trying to find a link between Supersonic Transports, Scholastic Aptitude Tests and the Miller Analogies Test (a high-level mental ability test requiring the solution of problems stated as analogies). According to Hadley, the current version of the dataset is MOHMAT4. From them: “…Up to 1996 the measurements used are those in the U.K. Marine Data Bank; more recent years use data coming in through the GTS. MOHMAT is no longer updated. After gridding the anomalies, bias corrections are applied to remove spurious trends caused by changes in ship deck heights and various unusual operational practices, and the data are smoothed to reduce noise. Arno, those of us in the interior portions of West coast states, and states just to our East, readily feel the ocean’s influence. Analogue years, years that mimic current oceanic conditions, are used to forecast the next three months for agriculatural purposes. Both temperature and precipitation amounts and type from these analogue years help farmers and ranchers make all kinds of risky decisions, made less risky by the predilection of our zonal climates to follow what the ocean is telling them to do. He has no problems discussing with dozens of crappy and downright wacky trolls. But he can’t discuss at WUWT!! …the ocean with a mass 1400 times that of the atmosphere dictates just how far atmospheric temps over land can stray. Exactly, despite meddling with data. Even in landmass dominated Northern Hemisphere natural variability is within a fraction of a degree. Steven lives in a convoluted subroutines of many computer programming languages. Analog thinking process causes crush in his undutiful capacious processing intelligence. Otherwise he isn’t a bad guy. Here is an interesting unpublished paper on aerosol, clouds and temperatures over the USA from 1985. It is scandalous that papers on these topics never get published. My first graph simply shows the annual rainfall statistics. You will see that the overall change over the 241 year period is an almost insignificant +2%. But my second graph plots regression slopes over each successive 50 year interval since 1770. This quite dramatically shows that the rates of change in rainfall (up and down) have reduced significantly in the last 50 years compared with earlier times. 2. Rainfall data show an equally un-alarming long term positive trend of 2% per century, with a recent distinct reduction in extremes. Despite these facts, the climate alarmists apparently want to close down Western civilisation without any empirical data at all to back up their theories. Thank you for that analogy. Very appropriate to climate as against weather as well. I hope you won’t mind my using it on occasion. The global sea temperature has been more or less the same give or take a degree or so over the last 1000 years. Get over it. Vukcevic says, August 11, 2012 at 1:56 am:Steven lives in a convoluted subroutines of many computer programming languages. Analog thinking process causes crush in his undutiful capacious processing intelligence. Otherwise he isn’t a bad guy. That is beside the point. Nobody is saying that Steven Mosher isn’t intelligent, kind to animals and young children, etc., and has probably never, ever committed a crime. What we are objecting to is that he is being incredibly rude and insensitive whilst a guest at Anthony’s private party. That big curve from 1860 down to 1920 and up to present agrees with the record of Armagh, presumably “non-continental” and non-air-conditioned. Can’t really blame NCDC for using 1895; that’s when the Weather Bureau set up its telegraph observation network, so it’s the start of regular records for most of America. It’s not a deliberate fudging of timeline. But starting at 1895 skips half of the curve, so most records are heading mainly upward since then. I mentioned the buoys (learn to spell) years ago, and Moshers response “Giss doesn’t use the buoy data.” Kinda late to the party, eh Mosh? Did you ever figure out ICOADS? Need help? Mosher was referring to my WUWT posts. I am looking forward to hearing (sooner than later) that Steven may be eating his hat. …one possibility is the movements of Earth’s core might disturb Earth’s magnetic shielding of charged-particle (i.e., cosmic ray) fluxes that have been hypothesized to affect the formation of clouds. 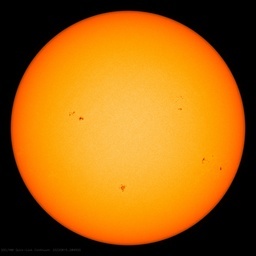 This could affect how much of the sun’s energy is reflected back to space and how much is absorbed by our planet. henrythethird: Check the last month of the MOHMAT data. I believe you’ll find that it’s 2007. You need to study a subject, Arno, before you make general statements like that that have no basis in fact. I believe you’ll find that about 85% of the variations in short-term and long-term land surface temperatures are in response to variations in sea surface temperatures. There are a multitude of observation-based and model-based studies about that subject. I’ve even written posts about it, using data to support my findings. BTW, your descripton of an El Nino event’s impact on surface temperature fails to consider that the majority of El Nino events are central Pacific, not east Pacific El Nino. You can do it by looking at the graph of the first temp plot. Remembering in a general way the warm and cool period of the last century – hot 30s -not so hot sea temps, cold 50s-60s hot sea temps but it seems that the sea lags the land by several years – probably decadal oscillations at work rather than lagging land heat. Arno: Further to my comment above, your description of El Nino cause and continental U.S. land surface temperature effect should exclude your reference to Kelvin waves crashing against the shore of the Americas. During an El Nino, it’s the change in location of the primary place of convection (from the Pacific Warm Pool to the central and sometimes eastern equatorial Pacific) that causes the shift in the jet streams, which in turn cause warming in some places and cooling in others. Mosher, bit of advice. Stop (deliberately?) alienating Anthony. He’s your host here. I surprised the low correlations with regions of ENSO and PDO. Thankyou for your permission to use your analogy. I, too, am shocked by the REP news. He was the best moderator I have seen on any blog. It is a terrible loss to us so I dare not think about the magnitude of the loss to his family. You mentioned the death of Moderator REP in your above post addressed to me. I wonder if you have noticed that the egregious Eric Grimsrud has used the REP condolences thread to make more of his disgraceful assertions. I have not answered because so-doing there would be very wrong. But you may be interested to know that according to him you and I are “quacks” and “professional deniers”. That anybody would post such comments on that thread emphasises what we already know of him. You’re not going to find a good correlation of US temperatures to surrounding sea surface temperatures. One issue is that US temperatures are so variable – they can be +/- 5.0C on a monthly basis while sea surface temperatures never have that kind of variability. 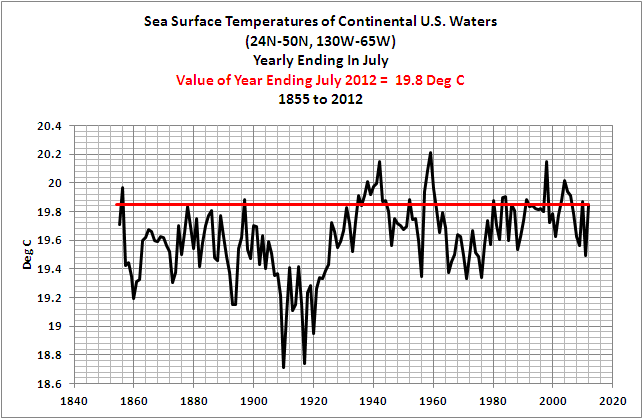 I’ve tried dozens of different sea surface temperature metrics before and have not found any kind of good match. A simple one that is as good as any other is the AMO index covering most of the north Atlantic and it is not good enough in my opinion. The prevailing wind patterns means that the North Pacific and the Tropical South Atlantic ocean should be influencing US temperatures but this is nothing to write home about either. Global temperatures for July are not that hot either. UAH is nowhere near global, I think it covers only the tropics? But my second graph plots regression slopes over each successive 50 year interval since 1770. I got your first graph on rainfall: not much change -looking from 1895 to 1995. What happens to that slope if you remove everything before 1895? I did not get your 2nd graph, you did not give me a link? IIRC, the UAH dataset covers 82.5° N to 82.5° S. A fairly good chuck of the globe. Given that the Arctic is likely on the warm side while the Antarctic slightly on the cool side, it might underestimate the temps slightly. However, I don’t think it’s anything meaningful. In addition, Arctic temps in the summer are always consistent so for the June/July numbers it should be very accurate. It looks like the offensive parts of his comment have since been snipped (which is appropriate). As for Grimsrud himself, one rarely runs into such a complete package of pompous arrogance mixed with complete ignorance of the subject matter he purports to have expertise in. Being called a quack by someone like Mann or Hansen would be validation. Being called a quack by Grimsrud is just amusing. I suspect that there might be the odd river or stream in Canada flowing into the Great Lakes. but if you look on the other side, e.g. at Anchorage, the amount of cooling is frightening. Someone or some body is trying to hide that data. Help me if you can. Looking at my own data, I think UAH is out by a bit. We are down by at least o.2K on earth since 2000. I would have to know the UAH calibration procedures and accuracy and precision data before you can convince me that I can trust UAH. HenryP says, August 11, 2012 at 11:43 am: I did not get your 2nd graph, you did not give me a link? Scroll down from the 1st graph on the same page! Anybody notice that La Nina may be rearing its head again? A little later, and not as strong, but a come back none the less? Nah, he’s just being The Mosh. The Armagh observatory is downwind (northwest) of Armagh town, where coal and peat (a very smoky fuel) were the main form of domestic heating until the 1970s. You can clearly see the warming trend resulting from phasing out these fuels post 1970s. Reduced aerosols/particulates = increased solar insolation. I’m not saying that warm surface waters never reach these higher latitudes but that would seem to be a tail on the end of El Nino, and not the primary driver that “raises global air temperature.” Maybe there is another un-invoked (un-named) process in Arno’s explanation that I’m not understanding. Pamela Gray’s comment @ 9:19 is a direct reference to eastern Oregon and Washington State including that we have mountains between this region and the Pacific Ocean. “Analogue years” sometimes tell us to expect colder and drier winters, sometimes wetter and warmer ones, and so on. I haven’t a current link to this concept for North America but here is one for Western Australia with page 6 showing “five closest analogue years” for their 9 May 2012 report. BTW, if you are looking for an Irish weather station without significant urban influences, your best bets are Valencia Island or Malin Head. Neither of which show significant 20th century warming. I think what Mosher is refering to is the inability to respond directly to a comment with a reply button. With the circumference of Earth being about 40000 km, the distance from 82.5 to 90 would be 7.5/90 x 10000 = 830 km. So the area in the north NOT covered is pir^2 = 2.16 x 10^6 km2. So if we double this for the south, we get 4.32 x 10^6 km2. Dividing this by the area of the earth, 5.1 x 10^8 km2, we get about 0.85% NOT covered and 99.15% covered by UAH. Because of the drought, the actual heat content of the air is likely to be low despite the “unprecedented” temperatures. More appropriately, the “unprecidented” temperatures are likely because of the low heat capacity of the dry air. The lower the heat capacity, the higher the temp rise for a given input of heat. La Nina causes drought in the southwest US. Drought in the southwest causes dry air in the southwest. Dry air in the southwest causes heat waves in the southwest. We are told that ‘global warming’ causes fewerand weaker La Ninas, so drought and heat waves in the southwest US should become less frequent/intense under ‘global warming’. So, this is not what ‘global warming’ looks like. Still think PDO isn’t real? When somebody tells me that they learned something about DATA by looking at slopes, the word that comes to mind is NOISE . Differentiators are noisy processes, and they can’t add any information that wasn’t in the original data, but they can certainly create illusions. Here’s one more Mosh comment today at Judith Curry’s blog criticising WUWT and having a discussion with two well known trolls, ” A Fan of More Discourse ” who used to post as ” A Physicist ” here and the other mindless troll lolwot. Again, here’s ” weary ” of discussing with the people at WUWT but has no problem discussing with mindless trolls who don’t talk any sense. And he’s deliberately misrepresenting what Anthony said about NOAA’s absolute temperature comparions, by again talking about lack of anomalising etc. it’s not that Mosh is not smart enough. He is smart. But he has definitely been stung ever since Anthony wrote the current surface stations record paper. From that time he has gone on a total antagonistic whining, moaning and sniping spree everywhere on the blogosphere about WUWT, totally negatively and with deliberate intention to hurt the reputation of WUWT and Anthony. In that process, he’s got his head too much up his own a**e to realise that it is he who’s looking like a proper pillock. Unprecedented since a week or two ago! Or whenever. ……..””””” When somebody tells me that they learned something about DATA by looking at slopes, the word that comes to mind is NOISE . Differentiators are noisy processes, and they can’t add any information that wasn’t in the original data, but they can certainly create illusions. I found the “noise” alright. It is in the data called “average “global” temperature”. Cannot get a rsquared better than 0.98 on the changes in degreesC/annum against time on that. If everyone continuously keeps looking at that, they will miss what is happening to our energy input. The rainfall data also seems a bit noisy to me, but I did find a pattern there from about 50 years. There is much less noise in the maxima. Give me those data anywhere anytime, and I will show the pattern, that already existed for hundreds of years. And nobody but me is plotting them…. Carry on, ploughing around in the darkness of your own foolish results. I’d say his bad behaviour dates from when he was asked tough questions here about BEST, which he couldn’t or wouldn’t answer. Although his behaviour may well have got worse after Anthony’s paper. Sorry MOD E, if you feel that there is an insult there please feel free to slip. I just wrote what I exactly felt about Mosh’s behaviour. I did not and do not like the fact that he’s been treated well by Anthony and repays by stabbing in the back in cowardly fashion. He’s going to town over WUWT literally every day and has a comment today in Lucia’s blog also about WUWT, in response to Willis’s challenge to him about his volcanoes article. This serial denigration of WUWT by Mosher every day bears out to the opinion I stated. The PDO is real. Most people misunderstand what it is. John, Arno would have to explain his erroneous description and assumptions. In reality: the trade winds and sea surface temperatures are closely coupled, and it’s a positive feedback loop, known as Bjerknes feedback. Something has to disrupt the positive feedback of the “normal” state in order for there to be an El Niño. Contrary to what Arno wrote, it’s a relaxation of the trade winds in the western tropical Pacific that initiates the El Niño. When the trade winds relax, gravity causes the warm water that was piled up in the west to slosh east. The mechanics of this have been known for decades. The trade winds relax due to weather-related phenomena called Westerly Wind Bursts, and there are a number of causes of those. The weather bureau records go back to 1735 and Harvard started a weather observatory in Boston in 1743. The weather bureau even has Arctic records starting in 1881, the first international polar year, when the Greely expedition sailed right up the then ice-free Nares strait and established a weather observatory at the northern end of Ellesmere Island. The NCDC US temperature records use to start in 1867, then 1880 and now 1895. In 1860, there were 500 individual stations already operating. 1895 is just a convienently low starting point. 1881 average temperatures got to +0.4C and the NCDC could not have that for example. 1878 got to +0.65C. So, here is the US temperature record back to 1743 (courtesy of Berkeley Earth and the NCDC – note that Berkeley has a 28% higher trend than the NCDC in the overlap period which appears to be the case with all of Berkeley Earth’s data – it has a higher trend than other available records which has not been explained so far – I believe their record splitting algorithm favours splitting break-points that go up over break-points that go down – who knows how that has affected the 1743 temperature record). Contiguous US temperatures on a monthly anomaly basis back to 1743. Now show me a calibration certificate of a thermometer, from, say, 1895? I highly recommend the comment thread linked by Ventor. In which Willis demolishes Mosher’s strawman arguments. Schmidt and company (fellow travellers) are rejoicing at the northern polar cap ice level today, yet don’t mention its polar opposite? there is no calibration certificate in the link? that means the accuracy and methodology is in question, of anything before 1900. When the trade winds relax, gravity causes the warm water that was piled up in the west to slosh east. The mechanics of this have been known for decades. The trade winds relax due to weather-related phenomena called Westerly Wind Bursts, and there are a number of causes of those. Westerly Wind Bursts is a phenomenological descriptor which tells us nothing. Please tell us more about the causes you allude to. Whatever they are, we need to keep in mind the furnace which ultimately drives the heat engine. So HeinrichP, I guess you live in St Louis Mo. I was living there in the mid 1960s when they built that famous memorial to the first people who were smart enough to clear out of town. Their first question after I told them my name was; ” Is that dt or two tees ? I guess your final comment went right over my head. Bob, I have a question regarding SSTs. Your graphs (thanx for using actual Temps) suggest near US ocean waters are around 295K, and I guess that globally we can be fairly sure they are greater than 273K. So MY BB radiation calculator, says that the largest near BB radiator on the planet, is emitting a roughly black body spectrum with a peak spectral emittance at something between 9.86, and 10.65 microns, with a mean of 10.1 microns at 288K. Some of the hottest desert surfaces must be peaking as low as 8.75 microns, and at nearly double the emittance of the 288K mean earth. So how in the hell can earth’s external emission spectrum correspond to an equivalent Temperature as low as 255 K , when there doesn’t seem to be ANY global BB like emitter that is at that Temperature ? We are told that the atmospheric gases do not emit a BB spectrum, since the normal atmospheric gases N2 and O2 don’t radiate, and atmospheric emission can only consist of greenhouse gas molecular line spectra (in bands) which don’t shift fequency with Temperature like BB thermal emission does. So what gives. Why does earth IR emission not look like a 273-295 K Thermal spectrum, with holes for the main GHG absorption bands. I expect to see holes, since the bands absorbed by GHG such as CO2, O3, and H2O, must get reradiated isotropically, so only about half can directly escape. So I’m puzzled; earth should not be emitting much in the way of a 255 K spectrum. George E. Smith; says: Your graphs (thanx for using actual Temps) suggest near US ocean waters are around 295K, and I guess that globally we can be fairly sure they are greater than 273K. Reynolds OI.v2 Global sea surface temp for 2011 was about 291 deg C and GHCN/CAMS Global land surface temp for 2011 was approx 283 deg K, so a weighted average would be near 289 deg K.
1. Cross-equatorial tropical cyclones in the western tropical Pacific. This refers to a time when one tropical cyclone exists north of the equator in the western tropical Pacific, while at the same time, another tropical cyclone exists there but south of the equator. These are discussed in Keen (1982) The Role of Cross-Equatorial Tropical Cyclone Pairs in the Southern Oscillation. tallbloke: And based on your follow-up comment, there’s no need for me to link that paper as well. But the statement you quoted (“…the occurrence and characteristics of WWBs may depend to some extent on the state of ENSO components, implying that WWBs, which force ENSO, are modulated by ENSO itself.”) is not unrealistic. ENSO simply provides feedback to itself.